Compact, one-piece foldable design fits into a compact car trunk Four-wheel independent suspension offers a comfortable ride Adjustable seat adapts to your growing child One-piece handlebar with wrist strap adjusts to your height Easy to Maneuver Four-wheel suspension and foam-filled tires provide a smooth, comfortable ride, even on bumpy roads and gravelly park paths. Additionally, a five-point harness keeps your little passenger safe and secure. 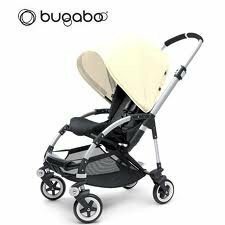 The Bugaboo Bee's two front wheels swivel a full 360 degrees, so you can maneuver the stroller with one hand. For further convenience, you can engage the brake that locks the rear wheels by pushing down with one foot. You can also lock the front wheels for added stability. Three-Position Seat Switches from Forward- to Rear-Facing The stroller's circular joint system allows you to switch seamlessly between forward- and rear-facing by easily lifting and turning the seat. For added flexibility, the stroller's seat adjusts to three convenient positions with one hand. You can start with your child upright for exploring the world, transition to a relaxing recline position, and straighten to flat for napping.